This is a 3 + hour workshop uses drawing, listening, and sharing as a self reflection tool. 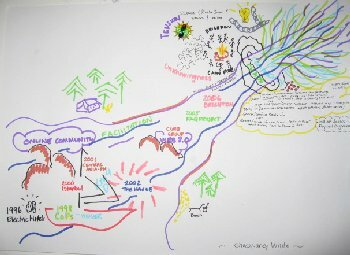 Participants will draw the river of their life – from origin to one year from now – exploring the past, present, and envisioning the future. The drawings will be shared with the group in a safe and supportive environment. Here the emphasis is not the drawing it’s self! The focus will be on having a space to flow, reflect, listen, and let realizations unfold. This can be a powerful practice to do at the beginning of the year, a life transition, new relationship, career change, or for a project. So join us for a fun, engaging and introspective afternoon! This workshop is open to all ages and all skill levels. Please feel free to bring your own art supplies. Paper, markers and crayons will be provided.